The headlining feature is the addition of media albums. 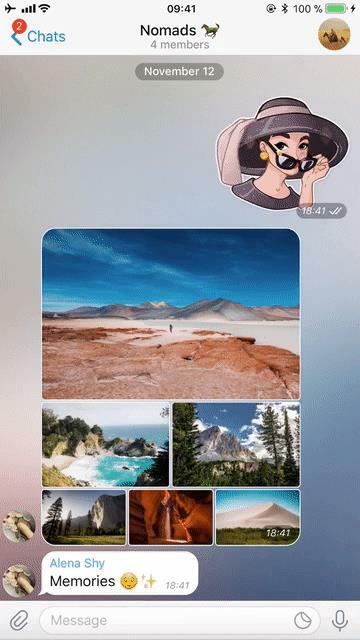 Whenever you send multiple photos or videos, Telegram will automatically create an album that can support up to ten files. They will be arranged in the chat window as “elegantly proportioned thumbnails.” The best part for the recipient is that he or she will receive only one notification, instead of the possible ten. I’m all for that. Along with the new albums, multiple profile photos are now possible in a similar fashion. So for all of you photogenic people that can’t decide on a single profile picture, you can set several that people can scroll through (in an album format) when they go to your profile. Continuing with photo stuff, users will now also be able to select in which order pictures get sent. Each file will show its sequence number, so that you can make sure that they go in the arrangement that you want. 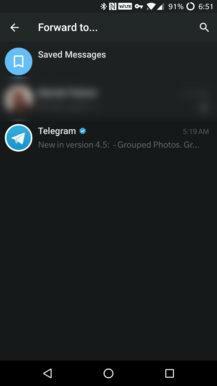 Telegram is also adding Saved Messages, which can be forwarded to and stored in your own personal cloud storage. When you go through your list of bookmarked things, there will be an option to go to the place in the chat where that message originated, because context is important. 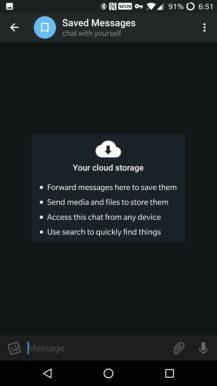 Saved Messages will be available in the sharing and forwarding menu, right at the top of the list, for easy management. 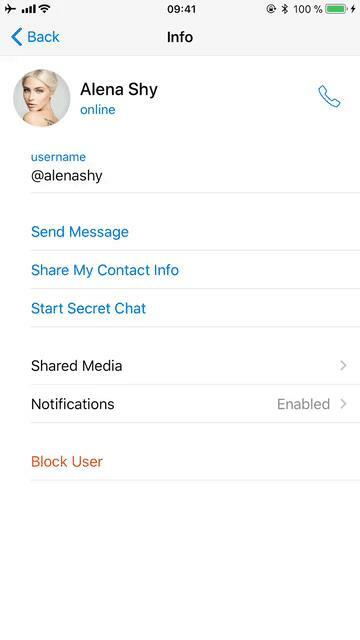 This private area will be easily accessible from the hamburger menu (right under “Contacts”). Keeping in the spirit of messages, group admins can now pin announcements and the like to the top of their group chats. 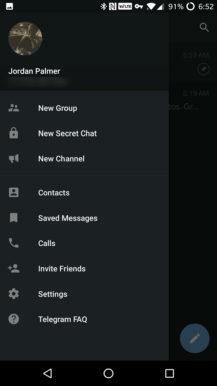 To wrap things up, Telegram is also improving its search capabilities. The algorithm for finding things like public groups, bots, and channels has gotten an upgrade — channels and bots can be searched for by name, and all the most popular items will be displayed first. This is a lot of stuff to take in, for sure, but I think it’s just further proof of Telegram heading in the right direction. 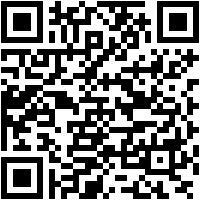 If you haven’t tried out the messaging service, I do recommend that you do so. We have the apk for you right from APK Mirror if you haven’t received the update in the Play Store yet, so get sideloading if you so desire.